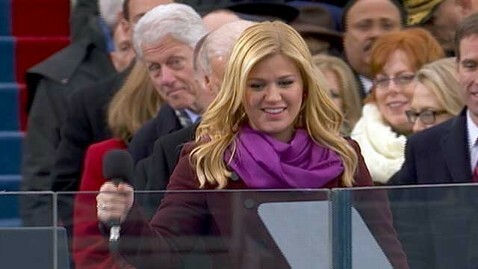 Former President Bill Clinton found a way to become the center of attention during Monday's inauguration when he inadvertently photo-bombed Kelly Clarkson as she took the stage to sing "My Country, 'Tis of Thee." As the former "American Idol" singer came to the stage, Clinton stuck his head into the aisle to catch a glimpse of Clarkson shortly after Obama took the oath of office. The photo became an instant hit on Twitter and made for some interesting memes. Clarkson, 30, took to Twitter shortly after the inauguration but made no mention of the photo-bomb. "What an honor to be a part of history! Obama's presence was powerful and his words unforgettable," Clarkson tweeted. "It's a proud day for America!"